Conservation Wire - A Heavenly Message for Bayer Inc - Bayer Neonics Non! A Heavenly Message for Bayer Inc - Bayer Neonics Non! (Montreal, QC, April 28, 2016) Around 9 am today Friends of the Earth Canada delivered a heavenly message to draw the attention of Bayer AG stockholders. The multinational corporation is a major manufacturer of bee killing neonicotinoid pesticides. 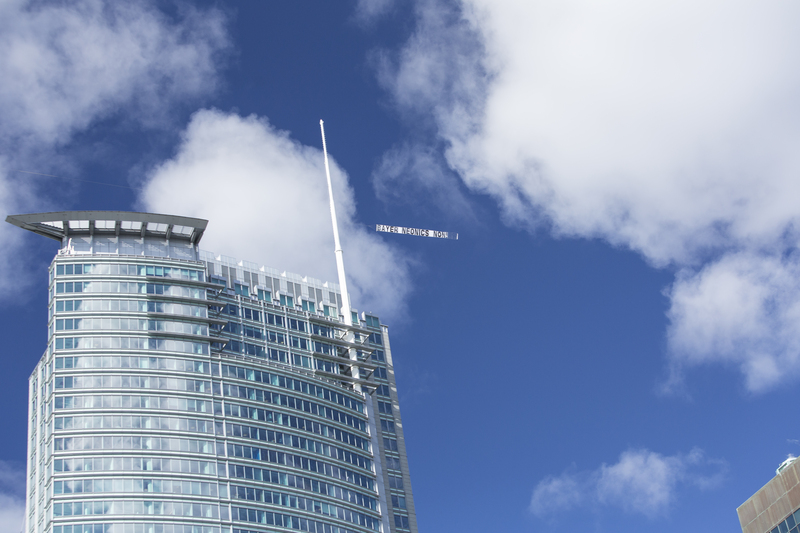 The message “Bayer Neonics Non!” was written on a 50 foot banner towed through the sky by Aerogram of Montreal. The flight path circled the Bayer Montreal offices at 1250 René-Lévesque West. Today, in their home countries, Friends of the Earth US, Germany and UK also protested Bayers’ neonics. Neonicotinoid pesticides, often called neonics, are used to on corn, soybean, canola and many other crops and have become the most widely used pesticides in the world. They have been on the market in Canada on a conditional basis since 2004. There is a growing body of evidence neonicotinoid pesticides are responsible, at least in part, for the huge losses incurred by Quebec and Ontario beekeepers. Neonicotinoids are showing up in lakes and rivers, streams and potholes across the country impacting not only pollinators but also birds and fish. The three most commonly used neonicotinoid pesticides have been banned in the European Union and regulated in Ontario but Canada’s Pest Management Regulatory Agency has failed to act. Friends of the Earth anticipates comprehensive action against neonics by the Province of Quebec in the near future. Bayer’s 2014 profits are based on $1.9 billion sales in Canada and €42.2 billion globally. Bayer supports CropLife the pesticide lobby headed by former Conservative cabinet minister Ted Menzies.